Why rehabilitate old cast iron, ductile iron or asbestos cement pipe? 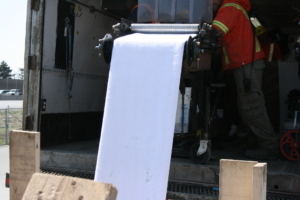 The overall quality and quantity of drinking water is a a constant concern to municipalities across North America. That is why FER-PAL has become a leader in the structural pipe lining solution through innovation. The traditional method of main cleaning and Cement Mortar Lining by open-cut replacement was the sole option. Although acceptable, advancements have been made and are available to municipal engineers. What is the alternative? 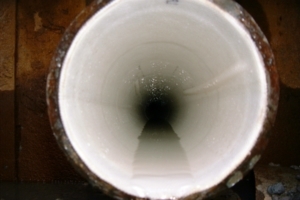 Cured-In-Place Pipe Lining (CIPP). CIPP is a Structural Pipe Lining Solution that eliminates the factors of internal and external corrosion and tuberculation, restores carrying capacity, eliminates discolored water, and decreases pumping and maintenance costs. More importantly, with restored flow and a stand alone structurally sound liner, the savings go on for many decades. CIPP allows for the rehabilitation of damaged pipes such as cast iron, ductile iron, and asbestos cement pipe. It is designed to structurally rehabilitate 150mm to 600mm distribution watermains by inserting a composite material liner into the host pipe. The liner itself is made up of two (2) concentric, tubular, plain weave polyester jackets with the inner jacket bonded onto a polyurethane elastomer. The polyurethane elastomer is potable water compatible and designed to maintain water tightness of the liner. The jackets are impregnated with a curable polymeric resin that plays two important roles. First the curable resin allows the tubular liner to adhere to the host pipe. Second, the curable resin, once reticulated, completes the formation of the composite structural liner. The resulting composite material liner has mechanical properties exceeding ASTM F1216 and ASTM F1743 recommendations for fully deteriorated pipe. Construction procedures are similar to that of The Cement Mortar Lining Solution. Prior to the insertion of the Structural Pipe liner the host conduit must be cleaned, removing accumulated scale and rust (tuberculation). Locating and mapping of the service connections will also take place. 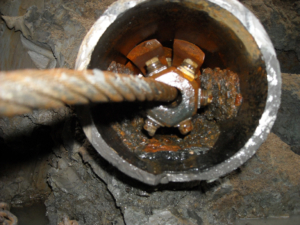 The excavation of individual water services is not necessary when the Structural Pipe liner has been cured in place. A dimple forms around the water service which makes its location extremely evident. A mechanical robot equipped with a camera is inserted into the rehabilitated conduit and activated by an operator using a remote control and television unit. The robot is equipped with a drilling tool that allows the operator to drill a hole in the liner at the precise location of the connection. Each location was previously recorded and mapped prior to the rehabilitation and insertion of the Structural Pipe liner. Such drilling action on the wall of the liner will not affect the water tightness of the rehabilitated pipe. 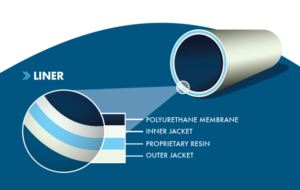 The thermo-curable polymeric adhesive that surrounds the threaded cavities of the service connections preserves water tightness and corporation stops and assures a tight bond with the liner. After opening the connections, the rehabilitated pipe is flush cleaned, chlorinated and service is restored. FER-PAL cleans the watermain before it is line and rehabilitated. Pictured is a mechanical scrapping removing tuberculation encrusted on the inside of the watermain. Future deterioration of road beds and asphalt due to trenching are minimized. For more technical information, including testing standards and case studies, please feel free to contact us.